Michael Rothstein takes a look back at the recruitment of Denard Robinson. Making the switch from quarterback to cornerback would be huge. I have a hard time believing that transition will happen. The Offense-Defense All-American Bowl will be played tonight at 8:00 p.m. in Houston and broadcast on Comcast Sports. There aren't any Michigan-committed participants, but several Michigan offerees and Big Ten-bound players will be involved. Starters: Michigan will be missing its two starting cornerbacks from the beginning of the year; sophomore Blake Countess tore his ACL in the opener, and fifth year senior J.T. Floyd has been suspended for the Outback Bowl for breaking team rules. Sophomore Raymon Taylor (5'10", 182 lbs. ), who replaced Countess for most of the year, will likely slide over to Floyd's boundary corner position. Taylor had his share of ups and downs on the season, but did a fair job overall and ended the regular season with 42 tackles, 2 interceptions (1 returned for a TD), 1 fumble recovery, and 1 pass breakup. Junior Courtney Avery (5'11", 173 lbs. ), who normally starts at nickel corner, will probably step in at Taylor's regular field corner spot. Avery struggled there in some limited time early in the season, but he'll have more reps this time around; playing a new position against Alabama is an extremely difficult task. This year Avery has 16 tackles, 2 tackles for loss, .5 sacks, 1 fumble forced, and 1 fumble recovery. Fifth year senior strong safety Jordan Kovacs (6'0", 202 lbs.) has actually seen his statistics decline a little bit this year, but he was named the team's MVP by his teammates; he has 65 tackles, 5 tackles for loss, 2 sacks, 1 interception, 2 pass breakups, and 1 forced fumble. Redshirt junior Thomas Gordon (5'11", 207 lbs.) is more of a strong safety masquerading, but he has shown a knack for creating turnovers in the past; he has 75 tackles, 4 tackles for loss, 1 sack, 2 interceptions, 1 forced fumble, and 2 pass breakups. This is not a great group individually, but along with Floyd, they had the #2 passing yardage defense in the country. Backups: Freshman safety Jarrod Wilson (6'2", 194 lbs.) has played more extensively than any other backup, but he hasn't had a signature positive play. The game is moving too fast for him, as it often does with young safeties. He could play a little bit at the nickel corner and has made 7 tackles and 1 fumble recovery on the year. Another candidate for slot corner is sophomore Delonte Hollowell (5'9", 176 lbs. ), who has 4 tackles and 1 fumble recovery but is more of a special teams player. The most interesting candidate for playing time is freshman Dennis Norfleet (5'7", 161 lbs. ), who returns kicks and ran the ball occasionally; he has now moved to defense in an attempt to shore up the depleted cornerback position. Junior safety Marvin Robinson (6'2", 200 lbs.) is a run stuffer who has played sparingly on defense and made 7 tackles and 1 fumble recovery. Redshirt sophomore Josh Furman (6'2", 203 lbs.) plays a lot on special teams but is a liability on defense; he has 10 tackles. Starters: Redshirt sophomore Victor Hampton (5'10", 197 lbs.) starts at one cornerback spot; he has made 34 tackles, 1 tackle for loss, 1 interception, and is tied for the team lead with 6 pass breakups. The other starter is senior Akeem Auguste (5'9", 188 lbs. ), who was injured early in the season and returned to start the last couple games; he has 15 tackles, 1 interception, 1 pass breakup, and 1 fumble recovery on the year. Senior D.J. Swearinger (6'0", 210 lbs.) is the free safety and has 70 tackles, 2.5 tackles for loss, 2 interceptions, 2 fumble recoveries, 1 forced fumble, and 5 pass breakups. Sophomore Brison Williams (6'0", 205 lbs.) starts at strong safety and has made 48 tackles, 1.5 tackles for loss, 1 sack, 2 interceptions, 1 forced fumble, 1 fumble recovery, and 4 pass breakups this season. Backups: Redshirt junior Jimmy Legree (6'0", 189 lbs. ), the other starting corner when Auguste was hurt, did a solid job. Legree is a converted free safety and has 43 tackles, 1 tackle for loss, and 2 interceptions. Redshirt freshman Ahmad Christian (5'10", 189 lbs.) has 8 tackles and 2 pass breakups as the backup to Hampton. Sophomore Kadetrix Marcus (6'1", 185 lbs.) backs up the strong safety position and has made 5 tackles. The Wolverines have the #2 pass defense and #35 pass efficiency defense in the country, but quarterback play in the Big Ten has been woeful and they'll be down a starting corner (or two, if you include Countess). Meanwhile, the Gamecocks have the #16 pass defense and the #34 pass efficiency defense in a schedule that included Georgia's Aaron Murray, Tennessee's Tyler Bray, Arkansas's Tyler Wilson, and Clemson's Tajh Boyd, not to mention East Carolina and UAB teams that put up pretty decent numbers through the air. The Wolverines have played a steady diet of teams that rank in the 70's or lower in passing offense, and Alabama's A.J. McCarron - whose team blew out Michigan - was the only decent passer on the docket. I don't think South Carolina quarterback Connor Shaw will shred the secondary, but the edge in defensive back play goes to the Gamecocks. This is a pretty good article on how deeply involved Hoke gets when coaching defensive linemen. It's interesting that he has developed such a reputation for "being a defensive line coach" when in fact he was a college linebacker. 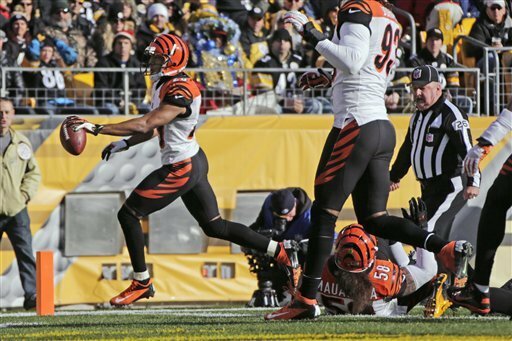 Cincinnati Bengals cornerback Leon Hall picked off his second pass of the year when he stepped in front of a pass from Ben Roethlisberger and returned it 17 yards for a touchdown. Hall also broke up 1 pass. The Bengals beat the Steelers, 13-10. The New England Patriots' Tom Brady completed 24/41 passes for 267 yards, 2 touchdowns, and 2 interceptions in a 23-16 win over Chad Henne's Jacksonville Jaguars. Henne finished 29/51 for 348 yards, 1 touchdown, and 3 interceptions. Philadelphia Eagle Brandon Graham made 6 tackles, 1 tackle for loss, and 1 pass breakup in a 27-20 loss to the Washington Redskins. New York Jet linebacker David Harris made 10 tackles and 1 pass breakup in a 27-17 loss to the San Diego Chargers. San Francisco 49ers wide receiver Mario Manningham tore his ACL and MCL when he caught his first pass on Sunday, so he'll miss the rest of the season. Tennessee Titans defensive tackle Mike Martin made 3 tackles, 1 sack, and 1 tackle for loss, but the Green Bay Packers won in a blowout, 55-7. Starters: Redshirt sophomore SAM linebacker Jake Ryan (6'3", 242 lbs.) is the best defensive player on the squad with 84 tackles, 13.5 tackles for loss, 4 sacks, 4 forced fumbles, and 3 pass breakups; he also plays some defensive end in passing situations. Senior MIKE Kenny Demens (6'1", 242 lbs.) struggled early in the season, but has played well down the stretch to notch 81 tackles, 6 tackles for loss, and 1 interception. Sophomore WILL Desmond Morgan (6'1", 227 lbs.) has 78 tackles, 5 tackles for loss, and 2 pass breakups on the year. Whereas South Carolina's defensive linemen make a lot of plays, Michigan's defensive linemen eat up space and have allowed these linebackers to all make 80-ish tackles this season. Backups: Freshman WILL James Ross (6'1", 225 lbs.) was named to the conference's All-Freshman team and made 34 tackles, 2.5 tackles for loss, and .5 sacks during the regular season; despite his youth and lack of size, he has been the most consistent backup. Fellow freshman linebacker Joe Bolden (6'3", 223 lbs.) backs up Demens at the MIKE and has 28 tackles, 3 tackles for loss, 1 sack, and 1 fumble recovery on the year. Redshirt junior Cam Gordon (6'3", 236 lbs.) hasn't made as many plays as I expected from him this year, but he has made 17 tackles, 3 tackles for loss, and 1 pass breakup while spelling Ryan. Starters: The Gamecocks basically run a 4-2-5 defensive, but safety-ish player DeVonte Holloman mostly plays like a linebacker, so I'll include him in this portion. Senior Holloman (6'2", 241 lbs.) plays the Spur position, a strongside outside linebacker position much like former Wolverine Steve Brown played in 2009; Holloman has 54 tackles, 7 tackles for loss, 2 sacks, 4 pass breakups, and 3 interceptions. Fifth year senior middle linebacker Reginald Bowens (6'3", 254 lbs.) has put up mostly modest numbers with 55 tackles, 1.5 tackles for loss, 1 sack, and 1 pass breakup, but has created several turnover opportunities with 3 forced fumbles and 2 fumble recoveries. Senior weakside linebacker Shaq Wilson (5'11", 224 lbs.) leads the team with 77 tackles and has 4.5 tackles for loss, 2 sacks, 2 interceptions, 1 pass breakup, 2 forced fumbles, and 1 fumble recovery. Backups: Senior middle linebacker Damario Jeffery (6'4", 233 lbs.) has 22 tackles, 3.5 tackles for loss, and 1 pass breakup on the year. Senior weakside linebacker Quin Smith (6'1", 239 lbs.) has 47 tackles, 4 tackles for loss, and 2 sacks on the year. Holloman rarely comes off the field. This is a tough choice. While Michigan's guys put up bigger tackle numbers, South Carolina's guys create more big plays with sacks, turnovers, etc. Additionally, all five Gamecocks who see significant time at linebacker are seniors. Both units are pretty good, but the playmakers and seniority are on the other side. Angelique Chengelis has a good piece on freshman running back/cornerback/returner Dennis Norfleet. The money quote from the grandmother who raised him: "I didn't finish school, but that doesn't mean you can't teach me." Starters: The Wolverines run a 4-3 Under defense. Senior strongside end Craig Roh (6'5", 281 lbs.) is a four-year starter and has 36 tackles, 5.5 tackles for loss, and 4 sacks on the season. The nominal starter at weakside end is sophomore Brennen Beyer (6'3", 252 lbs. ), who has made 18 tackles and forced 1 fumble on the year. Redshirt junior nose tackle Quinton Washington (6'4", 300 lbs.) has improved throughout the year but has notched just 29 tackles, 2 tackles for loss, and 1 forced fumble on the season; he's more of a space eater than a playmaker. Senior defensive tackle William Campbell (6'5", 308 lbs.) has made 44 tackles, but has just 1.5 tackles for loss and 1 sack. They don't make a ton of penetration, but these guys eat up blockers and allow the linebackers to flow to the ball. Backups: Sophomore weakside end Frank Clark (6'2", 262 lbs.) is the most prominent backup and the biggest playmaker of the entire unit; he has 25 tackles, 9 tackles for loss, 2 sacks, 1 forced fumble, 1 fumble recovery, and 3 pass breakups on the year. Junior defensive tackle Jibreel Black (6'2", 279 lbs.) has 18 tackles, 4 tackles for loss, 2 sacks, 1 forced fumble, and 2 pass breakups. Redshirt freshman Keith Heitzman (6'3", 270 lbs.) backs up Roh and has 7 tackles, 1 tackle for loss, and 1 fumble recovery on the year. Freshman nose tackle Ondre Pipkins (6'3", 340 lbs.) has just 6 tackles on the season. Starters: The Gamecocks run a 4-2-5 defense, basically with two strong safeties. Sophomore weakside end Jadeveon Clowney (6'6", 256 lbs.) is the star of the team; he's an All-American who made some Heisman ballots with 50 tackles, 21.5 tackles for loss, 13 sacks, 2 forced fumbles, and 2 pass breakups. The line is bookended by fifth year senior Devin Taylor (6'8", 267 lbs. ), who ended the regular season with 40 tackles, 8 tackles for loss, 3 sacks, 5 pass breakups, and 1 fumble recovery. In between are fifth year senior nose tackle Byron Jerideau (6'1", 316 lbs.) and sophomore defensive tackle Kelcy Quarles (6'4", 286 lbs.). Jerideau gets a little bit of push with 39 tackles, 4.5 tackles for loss, and 2.5 sacks on the year. Quarles has 36 tackles, 7 tackles for loss, and 2.5 sacks. Backups: Senior strongside end Aldrick Fordham (6'4", 269 lbs.) is Taylor's pass rushing sub, making 21 tackles, 5.5 tackles for loss, 4.5 sacks, and 2 forced fumbles. Even Clowney's backup, redshirt junior Chaz Sutton (6'5", 248 lbs. ), can get after the quarterback with 23 tackles, 7 tackles for loss, 5 sacks, 2 forced fumbles, and 1 pass batted down. Redshirt freshman Gerald Dixon, Jr. (6'3", 304 lbs.) and redshirt sophomore J.T. Surratt (6'2", 295 lbs.) are slightly less productive as the backup defensive tackles, with 22 tackles, 2.5 tackles for loss, .5 sacks, 1 interception, and 1 pass breakup among them. Okay, this isn't really a question. The Gamecocks have the better defensive line by far. Both of their backup defensive ends have put up better numbers than Michigan's most productive starter. They're #5 in sacks (3.33 per game) and #15 against the run (119 yards/game). Even with an All-American in Taylor Lewan at left tackle, South Carolina will likely give Michigan's offensive line fits. I used to wonder why Quinton Washington was a bit of a recluse during his recruitment and why we never really heard him say much. This explains everything. Video: Al Borges Reads "Twas the Night Before Christmas"
Starters: From left to right, the Wolverines start redshirt junior Taylor Lewan (6'8", 309 lbs. ), fifth year senior Ricky Barnum (6'3", 296 lbs. ), fifth year senior Elliott Mealer (6'5", 308 lbs. ), fifth year senior Patrick Omameh (6'4", 305 lbs. ), and redshirt junior Michael Schofield (6'7", 300 lbs.). Omameh has started 41 games, Lewan has 27 starts, Schofield has 22, Barnum has 15, and Mealer has 12. Altogether, they have 117 starts among them and average a shade over 6'5" and 303.6 lbs. The Wolverines are #25 in the country in sacks allowed (1.25 per game) and have the #40 rushing offense (187 yards/game). Backups: The Wolverines are very thin on the offensive line, but they've tried to preserve the redshirts of some highly touted freshmen. Other than redshirt freshman center Jack Miller (6'4", 288 lbs. ), the rest of the subs have been walk-ons. Redshirt sophomore guard Joey Burzynski (6'1", 295 lbs.) has made the biggest push for playing time of the entire backup crew; redshirt sophomore Erik Gunderson (6'8", 303 lbs.) and redshirt junior Kristian Mateus (6'7", 309 lbs.) have both played in blowouts, but both would be severely overmatched against the Gamecocks. Starters: Michigan recruited redshirt freshman right tackle Brandon Shell (6'6", 331 lbs.) and redshirt sophomore left guard A.J. Cann (6'4", 309 lbs.) coming out of high school. The line is completed with redshirt sophomore left tackle Corey Robinson (6'8", 337 lbs. ), fifth year senior center T.J. Johnson (6'6", 319 lbs. ), and junior right guard Ronald Patrick (6'2", 305 lbs.). Johnson has started 52 games in his career, Cann has 25, Patrick has 12, Shell has 9, and Robinson has 8. Altogether, the squad has 106 starts under their belts, but the tackles have less than a season of experience, and Robinson was a defensive tackle prior to this year. They average a bit over 6'5" and 320.2 pounds. The Gamecocks are #105 in the country in sacks allowed (2.92 per game) and have the #84 rushing offense (143 yards/game). Backups: Redshirt sophomore offensive tackle Cody Gibson (6'7", 278 lbs.) started a couple games early in the season. The other backups haven't been used much, including senior offensive guard Kaleb Broome (6'6", 332 lbs. ), redshirt junior center Travis Ford (6'3", 278 lbs. ), and redshirt freshman offensive guard Will Sport (6'5", 291 lbs.). Having watched Michigan's offensive line struggle to create a push all year long, it's a little tough to believe, but the Wolverines have the edge here. Despite being outweighed by an average of almost 17 pounds, Michigan gains more yards on the ground and allows fewer sacks. They also average a couple more starts each. Individually, the only South Carolina offensive lineman to garner consideration for All-SEC is Johnson (Second Team), whereas Michigan's Lewan is an All-American and Omameh was selected by the coaches as First Team All-Big Ten. Except for heft, Michigan is ahead everywhere. Chris Brown from Smart Football breaks down the outside zone play. Starters: Fifth year senior Roy Roundtree (6'0", 180 lbs.) has really stepped up his game since Devin Gardner stepped in at quarterback, and now has 28 receptions for 553 yards (19.8 yards/reception) and 3 touchdowns; 15 of those receptions, 378 of those yards, and 2 of those touchdowns have come from Gardner in just four games together. Redshirt junior Jeremy Gallon (5'8", 187 lbs.) has also increased his production, with 22 of his 40 receptions and 366 of his 684 yards coming from Gardner. 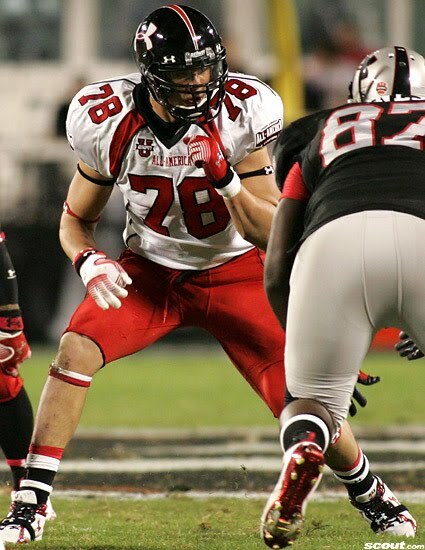 Fifth year senior Mike Kwiatkowski (6'5", 262 lbs.) has become the starter at tight end, but he's more blocker than receiver; he has just 4 catches for 37 yards on the year. Backups: Junior Drew Dileo (5'10", 180 lbs.) is the most dangerous of the backup wide receivers with 17 receptions for 309 yards (18.2 yards/reception) and 1 touchdown; he's sure-handed and reliable, but he's not very fast. The same descriptors could be used for junior Jeremy Jackson (6'3", 204 lbs. ), who has just 4 receptions for 31 yards on the year but plays quite a bit. Redshirt junior walk-on Joe Reynolds (6'1", 196 lbs.) has usurped some playing time from the aforementioned players and notched 3 receptions for 22 yards against Iowa; he's also a reliable blocker, although he has incurred a couple penalties. Freshman tight end Devin Funchess (6'5", 229 lbs.) was a revelation toward the beginning of the year, but he seems to have been forgotten a little bit down the stretch; he has not caught more than one pass in a game since the September 22 contest against Notre Dame. His last two receptions have gone for touchdowns, though, and altogether he has 14 receptions for 230 yards (16 yards/reception) and 5 touchdowns on the year. Starters: After the humongous Alshon Jeffery left for the NFL last season, the Gamecocks have turned to a trio of diminutive wideouts. Sophomore Bruce Ellington (5'9", 197 lbs.) leads the team with 38 receptions for 564 yards (14.8 yards/reception) and has notched 6 touchdowns. Junior Ace Sanders (5'8", 175 lbs.) is just behind him with 36 receptions, but he leads the team with 7 touchdown receptions; however, he has just 439 yards and isn't as much of a big play threat. Redshirt sophomore Nick Jones (5'7", 184 lbs.) is also a starter, but he has just 9 receptions for 119 yards (13.2 yards/reception) and 0 touchdowns on the year. Senior tight end Justice Cunningham (6'4", 264 lbs.) has 22 catches for 287 yards (13.0 yards/reception) and 0 touchdowns on the year. The receivers are small and slippery, but this isn't the same kind of passing offense that Steve Spurrier had when he was coaching the Florida Gators. Backups: Sophomore Damiere Byrd (5'9", 168 lbs.) has made some big plays with 12 catches for 303 yards (25.4 yards/reception) and 2 touchdowns. Freshman Shaq Roland (6'1", 173 lbs.) has 5 catches for 80 yards (16 yards/reception) and 1 touchdown, but he could see his role increase now that key backup D.L. Moore has been suspended for the bowl game. Freshman tight end Rory Anderson (6'5", 218 lbs.) is still very thin, but he has been a big-play receiver with 13 catches for 264 yards (20.2 yards/reception) and 5 touchdowns, the South Carolina version of Funchess. Extrapolated over an entire twelve-game season with Gardner at quarterback, Roundtree would have 45 receptions for 1,066 yards and 6 touchdowns, and Gallon would have 66 receptions for 1,098 yards and 3 touchdowns. That would give Michigan the Big Ten's top two receivers (Penn State's Allen Robinson leads the conference with 1,018 yards). Meanwhile, the Gamecocks receivers are solid and could give Michigan fits now that starting cornerback J.T. Floyd will miss the game. South Carolina's starters might have a better game, but the better receiving corps is Michigan's. Enjoy this video from Smart Football on attitude. I was totally unaware of Tony Branoff's place in Michigan football history until recently, but as a young-ish Michigan fan who's pretty well versed on the last twenty or so years of the Wolverines, it's probably time that I delve deeper into the earlier names, traditions, and accomplishments. Branoff passed away a few days ago, on December 20th. He played halfback for Michigan from 1952-1955 and was an All-Big Ten player as a senior. He finished his career with 1,299 yards rushing and 11 touchdowns; he also completed 6/18 passes for 2 touchdowns and 5 interceptions; caught 27 passes for 402 yards and 1 touchdown; returned 18 kickoffs for 415 yards; and returned 22 punts for 178 yards. His best game was Michigan's 20-0 shutout of Ohio State in 1953, when he had 114 yards rushing and 1 touchdown, along with 1 reception for 9 yards. Branoff ranks #38 in all-time rushing yardage at Michigan, which is two spots behind Jarrod Bunch and two spots ahead of Vincent Smith. Starter: Redshirt junior Fitzgerald Toussaint, a two-year starter, broke his leg against Iowa and will miss the bowl game. 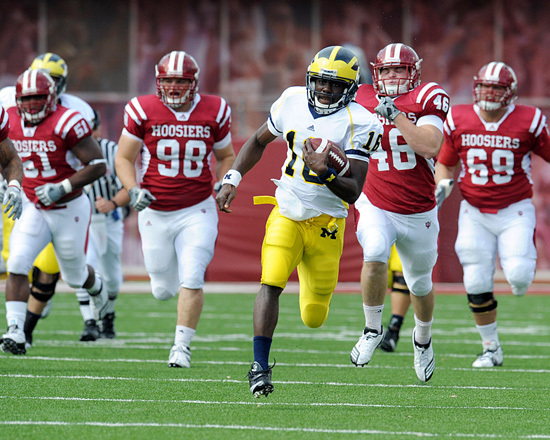 The person who should start at the running back is senior Denard Robinson (6'0", 197 lbs. ), even if he is able to throw the ball a little. Robinson has run the ball 154 times for 1,166 yards this season (7.6 yards/carry) and scored 7 touchdowns. In the two games since returning from his elbow injury, he has played a good deal of running back and totaled 220 yards on 23 carries (9.6 yards/carry) and 1 touchdown. Redshirt freshman Joe Kerridge (6'0", 244 lbs.) starts at fullback but rarely touches the ball, notching just 1 reception for 12 yards on the season. Backups: Sophomore Thomas Rawls (5'10", 218 lbs.) has been the main backup to Toussaint throughout the year. He carried the ball 57 times for 242 yards (4.2 yards/carry) and 4 touchdowns. He lacks some speed and vision, and he doesn't run as physically as one would expect from a back with his heft. Senior Vincent Smith (5'6", 175 lbs.) has been forced into action in situations that don't fit his skills; he has carried the ball 32 times for 88 yards (2.8 yards/carry) and 2 touchdowns. 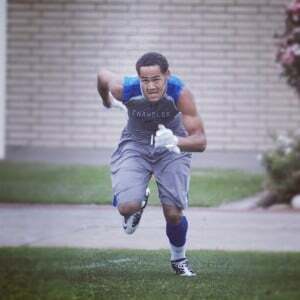 His biggest strength is as a receiver out of the backfield, where he has caught 9 passes for 65 yards and 1 touchdown. Little used redshirt freshman Justice Hayes (5'10", 183 lbs.) amassed 83 yards on 16 carries (5.2 yards/carry) and 1 touchdown in blowout wins over Illinois and UMass. Starter: Much like Michigan, South Carolina will be missing its starting tailback (junior Marcus Lattimore, who has decided to leave early for the NFL Draft) due to a leg injury. 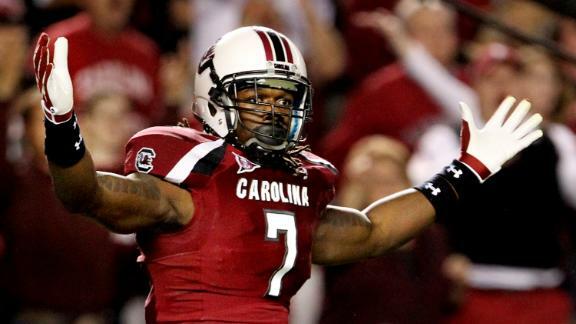 I have always thought Lattimore was overrated as a college running back, but he was the best the Gamecocks had. His absence leaves the job to fifth year senior Kenny Miles (5'9", 193 lbs. ), who ran the ball 99 times for 358 yards (3.6 yards/carry) and 2 touchdowns. He also has 16 receptions for 168 yards (10.5 yards/reception), so he's a threat out of the backfield, too. Backups: Freshman Mike Davis (5'9", 216 lbs.) has been very effective for a third-stringer with 52 carries for 275 yards (5.3 yards/carry) and 2 touchdowns. No other player has notched more than 5 carries this season. The true running backs on these two teams are not very impressive. Nobody on Michigan's team seems to have much of a chance to turn into a star, and the best prospect on either squad appears to be Gamecocks freshman Davis. However, the most dynamic player is converted quarterback Robinson, who has the ability to break a big run at any given time. Kyle Meinke discusses five issues that Michigan's football team faces as they begin practicing for the Outback Bowl in Florida. Starters: Michigan basically has two starters at this point - senior Denard Robinson and junior Devin Gardner. Robinson (6'0", 197 lbs.) has started 37 career games, but he was injured against Nebraska and has not started since. Gardner (6'4", 203 lbs.) has started the last four games for Michigan and is the superior passer. Against Iowa and Ohio State, Robinson played various positions, including wide receiver, running back, and quarterback, but he didn't throw a single pass in those games. Robinson finished the season with 1,319 passing yards on 54% completions, 9 touchdowns, and 9 interceptions; he also ran for 1,166 yards and 7 touchdowns and had 2 receptions for 24 yards. Meanwhile, Gardner completed 63% of his passes for 1,005 yards, 8 touchdowns, and 4 interceptions while rushing for 77 yards and 7 touchdowns; he also spent the early part of the season at wide receiver, where he caught 16 passes for 266 yards and 4 touchdowns. It's unclear who will start the bowl game, but it's very likely that both will play in some capacity. Robinson will have had over a month to rest his injured elbow, so I'm guessing he will be able to throw at least a little bit, but with the way Gardner has played at quarterback, I think Gardner has to take most of the snaps. Backups: Redshirt freshman Russell Bellomy made several appearance this season, including replacing Denard Robinson for the last 2.5 quarters of the Nebraska game; he has not played since. I think Bellomy has potential down the road, but there's no other way to describe his performance other than awful; he completed just 5/21 passes on the season for 46 yards, 0 touchdowns, and 4 interceptions. No other scholarship quarterbacks are on the roster. Starter: Junior Connor Shaw (6'1", 207 lbs.) has missed a chunk of playing time this season due mainly to a shoulder injury, but he should be ready to start the Outback Bowl. He finished the regular season with 1,732 passing yards on 67% completions for 15 touchdowns and 7 interceptions; he's also an effective runner with 339 yards and 3 touchdowns. Shaw is an athletic game manager and reminds me a little bit of what Tate Forcier could have been if he wasn't so stupid. Shaw has an accurate arm and decent speed, and he's thick enough to run through some tackles once in a while. Backups: Redshirt sophomore Dylan Thompson (6'3", 212 lbs.) played quite a bit this season with Shaw's injury. He completed 59/117 passes for 910 yards, 8 touchdowns, and 2 interceptions. He's not quite the same threat to run, though, with just 35 yards on 32 carries for 1 touchdown. Robinson is one of the most dynamic runners in the country, and he's the best running quarterback in the country. Gardner is a pretty good runner, and his passing is almost on par with Shaw's, although I would give Shaw the edge due to experience. As a total package, Michigan has the advantage here. 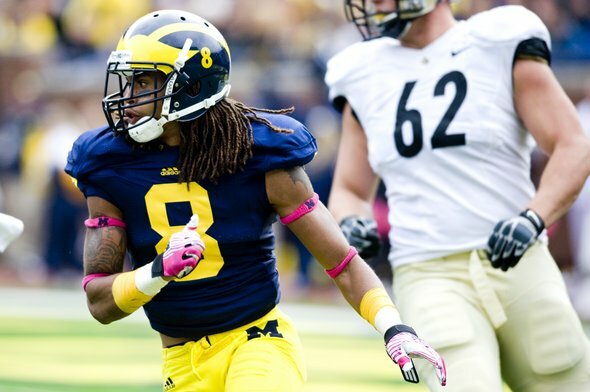 Of course, this ignores the fact that Michigan will be missing its most experienced starting cornerback in J.T. Floyd while South Carolina has a couple playmakers on the back end of their defense in safeties DeVonte Holloman and D.J. Swearinger. But more on that will be coming in a few days. Philadelphia (PA) West Catholic offensive tackle Jaryd Jones-Smith was offered by Michigan. Jones-Smith is a 6'7", 300 lb. tackle with offers from North Carolina State, Pitt, Virginia, and Wisconsin. Michigan just offered him in the last few weeks, around the same time they started pursuing Cameron Hunt, Kenny Lacy, and Dan Samuelson. Since that time Michigan won a re-commitment from offensive guard David Dawson, but the Wolverines are looking to add another lineman, so it makes sense that they would be pursuing guys who can play tackle at this point. Also, his nickname is "Hamburger." Pickerington (OH) Central outside linebacker/defensive end Jae'Sean Tate was offered by Michigan. Tate is a 6'6", 200 lb. prospect who is committed to Ohio State to play basketball. The Wolverines are also pursuing him for basketball, so perhaps the coaches are hoping that the opportunity to play both sports could entice him to come north. Monaca (PA) Central Valley wide receiver Robert Foster committed to Alabama. Foster is widely considered to be an elite talent, but it sounds like he'll have to spend a year at prep school before qualifying to play for the Crimson Tide. Mesquite (TX) West Mesquite wide receiver Eldridge Massington committed to UCLA. Massington had previously been committed to USC, but they sort of pulled the rug out from under him because of his early-season ACL tear. He must have really wanted to be in Los Angeles, though, because he committed to their cross-town rival. Chantel Jennings breaks down a few of the rules and ramifications of the current recruiting dead period. This is about Patrick Omameh. And if you know anything about Omameh, it's an article full of positives. 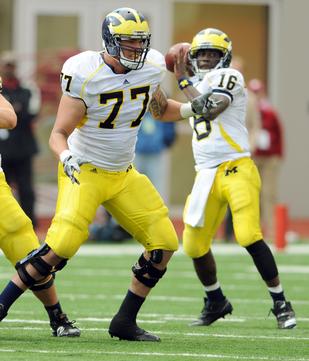 Kyle Meinke looks at the immediate future of the offensive line through the eyes of Taylor Lewan. Smart Football: Long live the Air Raid! The Air Raid is Dead? Chris Brown explores the idea that the Air Raid might not be able to go everywhere and still be successful. If every team runs the Air Raid, others get used to defending it. Or perhaps even worse, they get better at running the offense than you. Yannick Ngakoue - LB - Washington, D.C. Projection: Wide receiver. Sometimes big kids like Sykes get projected to tight end, but he doesn't have the current bulk to be a surefire prospect there. He looks like someone who will remain on the outside, but he probably won't develop into a consistent deep threat because of a lack of speed. Sykes looks more like a possession receiver, but he has a chance to be very productive because of his frame. Guys like Mike Williams and Dwayne Jarrett, for example, had a lot of success at USC without being burners. I also like the way he blocks and hustles, so I think he would fit in well where he doesn't have to get 80 catches a year to be happy. This is the conclusion that you reach when you play the #1, #2, and #3 teams in the country . . . all on the road. In the slowly evolving world of Touch the Banner, I have finally decided to make commenters sign in to post. I have the sometimes tedious task of moderating comments; deleting e-mails, marking comments as spam, etc. has become too cumbersome for me to continue, so I changed the settings. I apologize to those of you who enjoy commenting anonymously, but that's how the internet goes. I have also purchased the domain www.touch-the-banner.com, which simply redirects you to the Blogspot address, something I plan to update during the offseason. I am not savvy when it comes to programming and such, so those kinds of upgrades involve enlisting help from others. Also, if you have any suggestions for post ideas, upgrading the site, etc., please let me know via comments or e-mails. As always, thanks for visiting the site. It's a lot of fun to discuss Michigan football with you all. Mel Kiper, Jr. - and just about everyone - thinks that Denard Robinson is going to have to make a living in the NFL by playing some position besides quarterback. The AP All-America Team was released last week, so this isn't exactly a timely post, but I figured I would gather together the names of players that are pertinent to Michigan fans. Of the 75 total players listed on the first, second, and third teams, Michigan played (or will play) against 17 of them, or 23%. This just reinforces how difficult Michigan's schedule was, as the Wolverines lost a close game to the #1 team (4 players), lost in a blowout to the #2 team (6 players), lost a close game to a 12-0 team in Ohio State (3 players), and then lost by two scores to Nebraska (1 player). I threw in Arizona RB Ka'Deem Carey simply because he plays for former Michigan coach Rich Rodriguez and leads the country with 1,929 rushing yards (and will end the bowl season that way unless someone else busts out with a couple hundred yards in a bowl game, which is possible). Players are listed in order of remaining eligibility. With 73 scholarships allotted and 13 seniors scheduled to graduate, Michigan's recruiting class of 2013 should be around 25. Adam Rittenberg ranks the Big Ten's best bowl games, and Michigan vs. South Carolina in the Outback Bowl comes in at #2. Behind the Rose Bowl. Obviously. Detroit (MI) Cass Tech offensive guard David Dawson re-committed to Michigan. Detroit (MI) Cass Tech cornerback/safety Delano Hill changed his commitment from Iowa to Michigan. Brantford (Ont.) Pauline Johnson offensive tackle David Knevel was offered by Michigan. He's a 6'8", 290 lb. prospect who is supposed to announce his college decision on Tuesday, which is reported to be between Alabama, Nebraska, and West Virginia. It's unclear whether Michigan's offer will change that announcement date or factor into his decision, but he has not visited Ann Arbor and has already used all five of his official visits allowed (to the three above schools along with Washington State and Wisconsin). Of course, Ontario is significantly closer than any of those other schools, so a 3.5- or 4-hour car ride might be feasible. Belton (TX) Belton tight end Durham Smythe decommitted from Texas. Michigan does not appear to be back in the hunt, but it looks like a re-commitment to Texas is probably out the window. Florida, Stanford, and Notre Dame all appear to be strong possibilities as of now. Fort Lauderdale (FL) University School defensive tackle Maquedius Bain committed to LSU. Bain never visited Michigan and was not a serious option at this point, although I do really like him as a prospect. Here's a list of players who visited this past weekend. St. Clairsville (OH) St. Clairsville linebacker Michael Ferns, a 2014 commit, released his junior season highlights. This is pretty superficial, but you can see pictures, interesting haircuts, and short shorts on several of college football's coaches from when they were in high school. Fifth year senior cornerback J.T. Floyd, junior punter Will Hagerup, and senior linebacker Brandin Hawthorne have all been suspended for the Outback Bowl against South Carolina, which will be played on New Year's Day. Floyd has started all 12 regular season games at boundary corner, making 48 tackles, 1 tackle for loss, and 5 pass breakups. However, I have been a pretty persistent and vocal critic about his play, because he lacks speed and playmaking ability. He's also not a very physical player, and he was beaten deep several times this year, although the Big Ten's mediocre quarterbacks rarely connected. His replacement will likely be Raymon Taylor at the boundary corner spot, with Courtney Avery probably stepping in at field corner. This could also cause recent position switcher Dennis Norfleet or sophomore Delonte Hollowell to get some playing time on defense. Hagerup is the Big Ten's best punter, averaging 45.0 yards per punt. Thirteen of his 33 punts went farther than 50 yards. His replacement will probably be Matt Wile, who averaged just 31.9 yards per punt, but 7/9 of those landed inside the 20-yard line. Last season Wile averaged 41.6 yards per punt when Hagerup was suspended for the first four games of the season. Hawthorne was completely limited to special teams this season, making 19 total tackles. As a small-ish, speedy linebacker, he was very solid in kickoff coverage. But he has clashed with coaches at times, made some halfhearted plays, and generally played/behaved his way out of regular playing time. Despite having some playmaking ability - witness his one-handed interception in April's spring game - he was surpassed at inside linebacker by freshman Joe Bolden, freshman James Ross, and a guy who has yet to make a single positive play in a Michigan uniform, Mike Jones. The biggest loss might be Floyd, because Michigan had already been without starting cornerback Blake Countess for the entire season due to an ACL tear. Now Michigan's #3 and #4 corners to start the year will probably line up for the majority of the Outback Bowl, and guys who have played sparingly will be forced into action while other players shuffle around. Detroit (MI) Cass Tech safety Delano Hill committed to Michigan on Saturday. He had previously been committed to Iowa while also holding offers from Illinois, Pitt, and Syracuse. Hill is a 6'1", 198 lb. prospect. He claims a 4.44 forty, a 4.34 shuttle time, and a 32" vertical. As a senior in 2012, he had 60 tackles, 2 interceptions, and 1 touchdown return. Hill visited Michigan back in the spring, but Michigan's coaches didn't give him a ton of recruiting attention throughout the process and did not appear to be on the path to offering him a scholarship. Iowa, which does a good job of recruiting the Detroit area, swooped in with an offer that he accepted back in July. The Hawkeyes had a poor season, going 4-8 as the team adjusted to several new assistant coaches. It's unclear whether this lack of success had an effect on Hill's decision, but he was offered by the Wolverines this past week and visited Ann Arbor for a bowl practice on Friday. By Saturday morning he had selected the Wolverines. Cass Tech head coach Thomas Wilcher claims that Hill is the best pure athlete on his high school team, which includes several Division I prospects like cornerback Jourdan Lewis, cornerback Damon Webb, running back/linebacker Deon Drake, and running back Mikey Weber (along with several others). Hill reportedly ran a 4.40 at Nike's The Opening in July. His speed is well documented and shows up in games, too, which isn't always the case for guys who have good forty times. He has good length and leaping ability, which should prove to be an asset in coverage. My biggest question mark about Hill - and this is significant to me because it might determine his future position - is his tackling ability. While some scouting reports tout his tackling ability, I don't see it on film. He's not a very aggressive tackler and doesn't display a natural instinct to stay in front of runners. Rather than squaring up ball carriers for solid hits, he tends to reach. And while I have seen a clip or two of him being physical with shedding blocks during his senior season, that was a problem for him as a junior. Normally, I am not a fan of moving a player back in the defense; witness the way Josh Furman has struggled with going from outside linebacker in high school to safety in college. As a high school strong safety, moving to cornerback could be too much of a shift to overcome. However, Hill's lack of physicality makes me think that his best position could be boundary corner. Unless he gets significantly stronger and more aggressive, he could be a liability as the last line of defense. At this point in the recruiting process, Hill is the type of player that often fills out a roster. While he's not a truly elite athlete, he offers some upside due to raw athleticism and the potential to help out on special teams. This is not a player whom you expect to come in and challenge for a starting job immediately. He helps to fill the void left by Gareon Conley (who decommitted in favor of Ohio State) and potentially softens the blow of losing out on Seffner (FL) Armwood defensive back Leon McQuay III, an elite prospect who is also heavily considering Florida State, USC, and Vanderbilt. This gives the Wolverines 24 commitments in the class of 2013, a group that should reach 25 or more. As an avid fan of Michigan football, I was not surprised at all when J.T. Floyd turned down a chance to enter the NFL Draft. Considering that Morgan Trent was a 4th round pick as a fifth year senior and Donovan Warren went undrafted as a junior, Floyd - who is significantly slower than Trent and less productive than Warren - might still go undrafted in 2013. Detroit (MI) Cass Tech offensive guard David Dawson committed to Michigan again today. He originally committed to the Wolverines in February but . . . well, you can find the story here. My opinion on Dawson hasn't really changed since he committed the first time, so here's his original commitment post. As far as I know, he hasn't released any highlights from his senior year, so I might recalibrate my projection if I see a little bit more recent highlights. We had a spirited discussion recently about whether Dawson should have been re-offered by Michigan coaches. You can find that discussion here if interested. Dawson (and teammate Delano Hill) gives Michigan 24 commits in a class that will almost certainly reach 25, if not more. As the fifth offensive lineman in the class, Michigan could sit tight or perhaps pursue another commitment from someone like Corona (CA) Centennial's Cameron Hunt, particularly if redshirt junior offensive tackle Taylor Lewan declares for the NFL Draft. Jerald Robinson did not catch this. Redshirt sophomore wide receiver Jerald Robinson has left the football program. A 6'1", 215-pounder, he played sparingly over the past couple seasons, making just 5 receptions for 69 yards, all in 2012. It is unclear whether he left for a better playing opportunity elsewhere or if he didn't get along with the coaching staff, but he has often been at odds with the coaching staff(s) since coming to Michigan. As a freshman in 2010, he was one of the players who had to "earn his wings" from head coach Rich Rodriguez - a group of players that also included Tate Forcier and Austin White, neither of whom made it through the 2010 season. Since then reports have persisted that he lacked the dedication and work ethic to be a significant contributor, even though many departing seniors pegged him for a future breakout star because of the catches he would make in practice. Those plays never showed up in games, though. Looking back at his high school career, he was always a guy who lacked speed and caught the ball in his body. You can view his highlights and watch him make body catch after body catch, get caught from behind, and catch short passes over the middle where he gets caught and tackled rather immediately. Some people - including me - thought he might be better off playing safety. He had a few opportunities this past season to catch balls that were outside the frame of his body, but the only ones he seemed to reel in were those that hit him near the numbers. 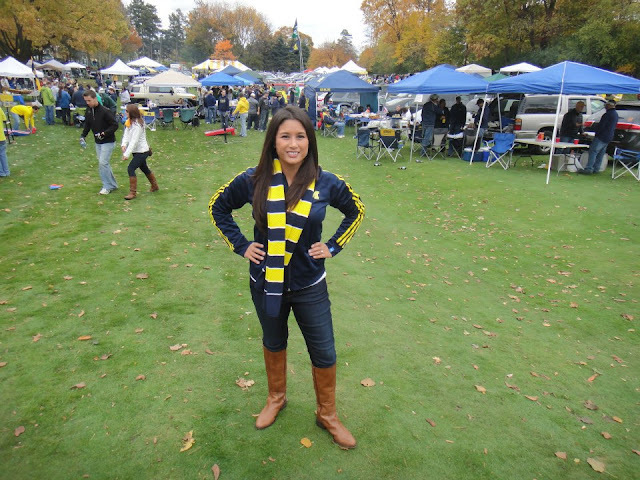 Rodriguez's 2010 recruiting class has now been whittled down to 12 players after initially being 27, Michigan's largest class in the Rivals/Scout era of recruiting. Rodriguez took just 9 offensive players in that class, and only 3 remain - quarterback Devin Gardner and wideouts Drew Dileo and Jeremy Jackson. By way of comparison, just 6 of 20 recruits from the 2011 class have left the program; and 8 out of 20 recruits from Lloyd Carr's last full class left the program early. So while 40% of Carr's final full class left the program before exhausting their eligibility, 56% of Rodriguez's last full class are gone before three full years have passed. EDIT: This brings the number of available scholarships in 2013 to a whopping 25. Wide receivers remaining on the team next year will presumably include seniors Drew Dileo, Jeremy Gallon, and Jeremy Jackson; sophomore Amara Darboh; redshirt freshman Jehu Chesson; and incoming freshmen Jaron Dukes, Da'Mario Jones, and Csont'e York. For news on other former Wolverines, check out the Ex-Wolverine Encyclopedia. I was asked for a list of prospects who are planning to visit on the huge recruiting weekend of December 14. 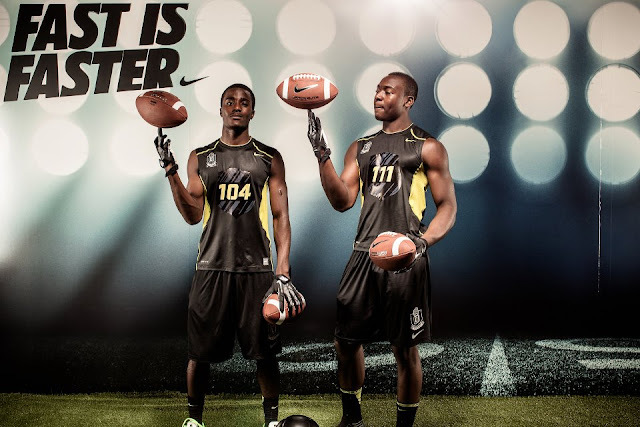 This is when most of the 2013 class is planning to take their official visits. Kyle Bosch - OG - Wheaton (IL) St. Francis: Bosch committed to Michigan in February. Gareon Conley - CB - Massillon (OH) Washington: Conley decommitted from Michigan shortly after Thanksgiving. 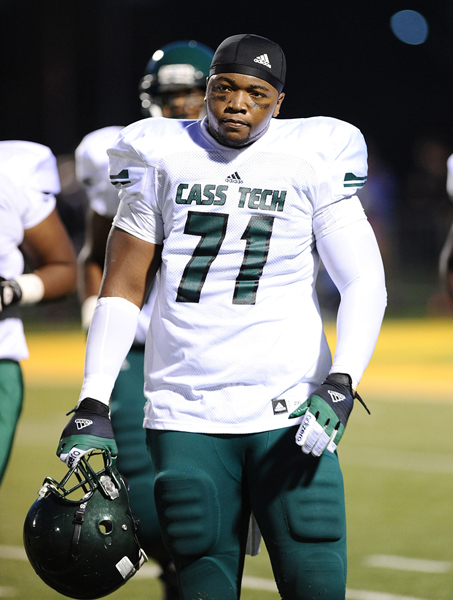 David Dawson - OG - Detroit (MI) Cass Tech: Dawson decommitted from Michigan in mid-October. 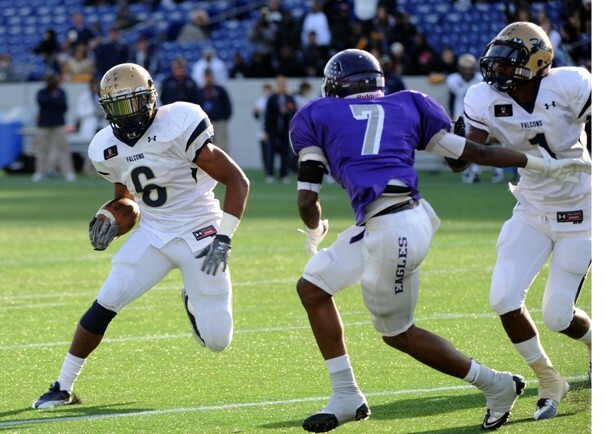 Ross Douglas - CB - Avon (OH) Avon: Douglas committed to Michigan in July. Ben Gedeon - LB - Hudson (OH) Hudson: Here's a look at how Gideon's senior season progressed. He appears to be headed for WILL linebacker at Michigan. Delano Hill - S - Detroit (MI) Cass Tech: Hill was offered this past week and is the teammate of several Michigan players, along with 2013 commit Jourdan Lewis. He's a 6'1", 198 lb. prospect who could play safety or boundary corner. He is currently committed to Iowa. 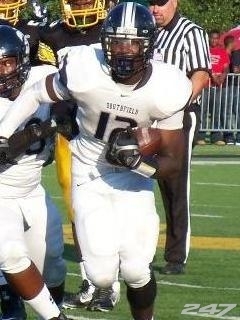 Khalid Hill - TE - Detroit (MI) East English Village: Hill committed to Michigan in February. Cameron Hunt - OG - Corona (CA) Centennial: I wrote up a scouting report on Hunt recently. UPDATE: Hunt will be playing in the state championship game next weekend, so he'll visit in January instead. Maurice Hurst, Jr. - DT - Westwood (MA) Xaverian Brothers: Hurst committed to Michigan in June. Kenny Lacy - OT - Phoenix (AZ) Mountain Pointe: I wrote up a scouting report on Lacy recently. UPDATE: Lacy has rescheduled his visit for January 18. Mike McCray II - LB - Trotwood (OH) Trotwood-Madison: McCray committed to Michigan in March. Shane Morris - QB - Warren (MI) De La Salle: Morris committed to Michigan all the way back in May 2011. 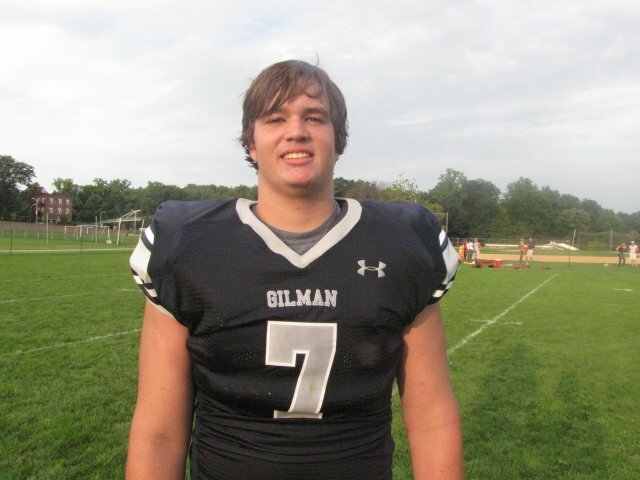 Henry Poggi - DT - Baltimore (MD) Gilman: Poggi committed to Michigan in June. Dan Samuelson - OG - Plymouth (IN) Plymouth: Samuelson is a 6'5", 290 lb. guard who's committed to Nebraska. He also has offers from Illinois, Minnesota, and Pitt. Dymonte Thomas - S - Alliance (OH) Marlington: Here's a look at how Thomas's senior season progressed. Logan Tuley-Tillman - OT - Peoria (IL) Manual: Here are some highlights of Tuley-Tillman's senior season. Csont'e York - WR - Harper Woods (MI) Chandler Park: York committed to Michigan in May. Bill Barnwell profiles former Michigan quarterback Jim Harbaugh, current head coach of the San Francisco 49ers. 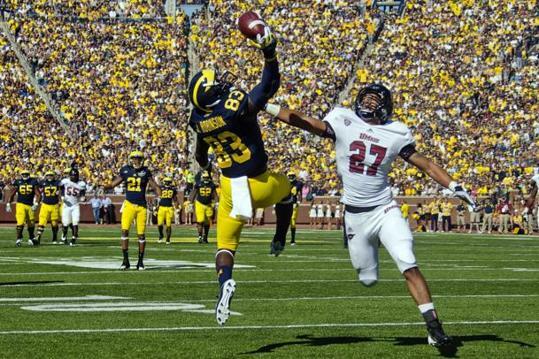 With Denard Robinson graduating, Michigan's Heisman hopes for 2013 now rest squarely on the shoulders of Devin Gardner. It's nice to know that some national analysts have their eyes on Gardner, too. Poll Results: Who should win the Heisman? CBS Sports: The era of the "Super QB"
Recruit Tracker: Maurice Hurst, Jr.
Senior Highlights: Maurice Hurst, Jr.